Join us in recognizing the friendly faces in patient registration by celebrating Patient Access Week, March 31 – April 6, 2019. 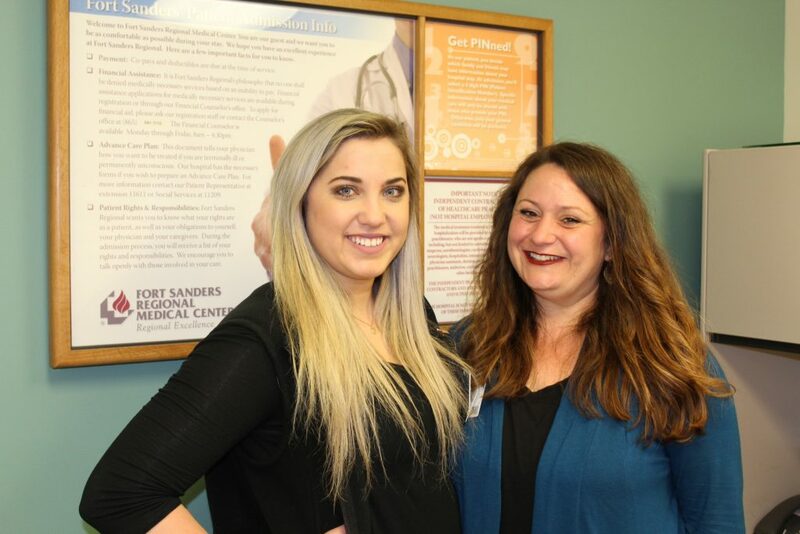 Our staff in registration are often the first stop for patients before undergoing treatment at Fort Sanders Regional. The team in registration strive to be goodwill ambassadors for the entire facility and provide the best first impression to everyone they encounter. Patient registration specialists Macy Lawson and Lucie Archer both share a positive attitude and passion to help in any way they can. Get to know more about Macy and Lucie below. Lucie: I am from Knoxville. Macy: I am approaching my 4th year. Lucie: I have worked here 14 years. Tell us a little bit about your job at FSR? Macy: I work in registration in the emergency department. We do the initial intake before a patient is seen and verify that all of their information is correct. Lucie: In registration, we are the first people you encounter when you get to the hospital. I try to have a smile on my face and be in a friendly mood to help patients have a good experience at Fort Sanders Regional. How do you try and help patients each day? Macy: When patients come in the ED, it is normally for an unexpected emergent situation. I try and have a positive attitude to try and set them out on the right foot. Lucie: I try and be a friendly face and quell any fears they may have about being at the hospital. I let them know that I am here to help in any way that I can. What do you enjoy the most about working in registration? Macy: I enjoy the interaction with the patients and knowing that even though I’m non-clinical, I can still play a factor in helping someone feel better. Lucie: I like the constant stream of new people I have the opportunity to meet. I also enjoy that there are so many people I work with who I know and have relationship with. Macy: I have a 2-year-old son, and I spend almost 100 percent of my free time with him. Lucie: I have a 7-year-old daughter who is my everything. I spend my time taking her to extracurricular activities. I also enjoy gardening and antiquing.